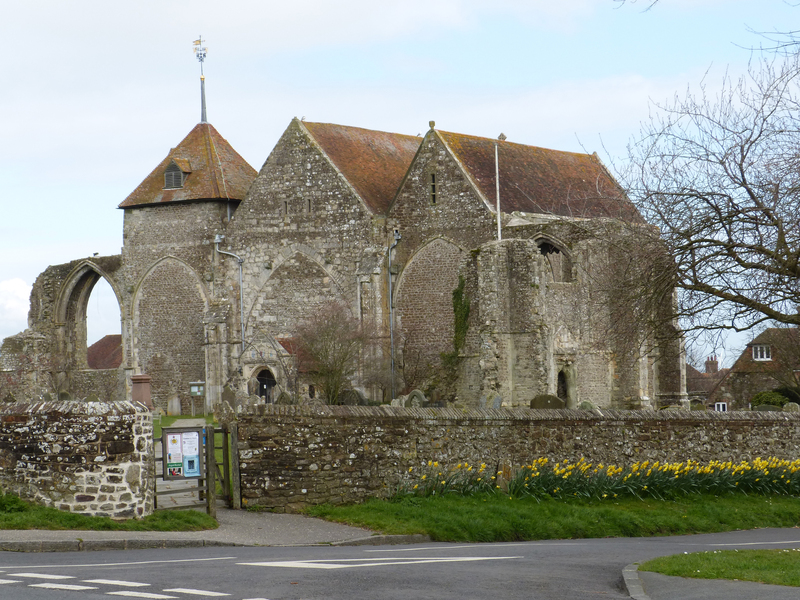 On my way to Rye last Friday the bus I was riding passed through a beautiful old village and passed by this ancient church. I had to return to it today. 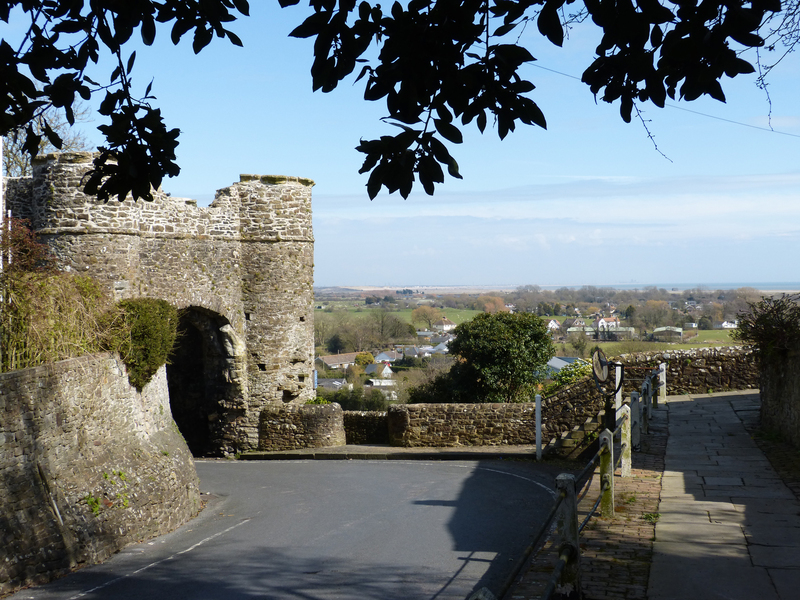 The town is called Winchelsea. Today I returned to take pictures and investigate this small but historic place. 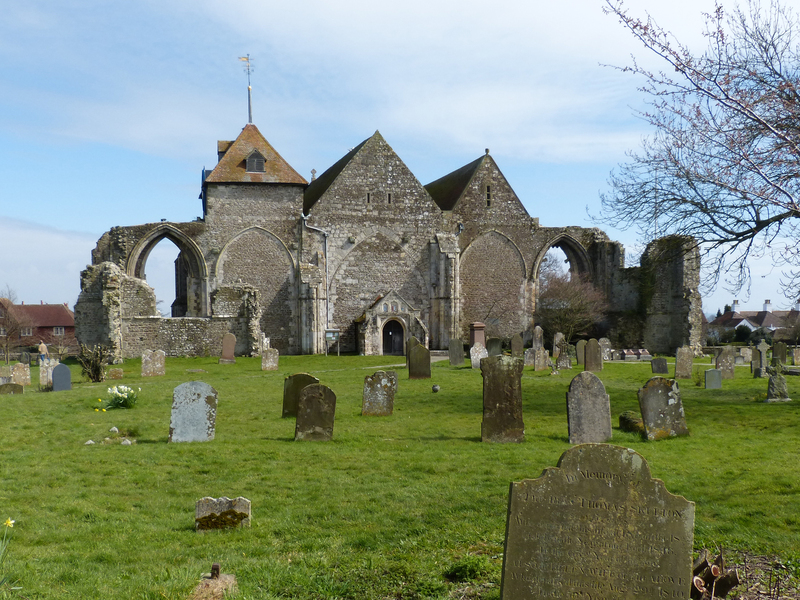 I learned that this is the second Winchelsea, the first having been wiped out in by a storm in 1288. That first town had been an important and prosperous port. You can read much about its history here. It was decided to move the town inland and onto higher ground. That is the village I visited today. 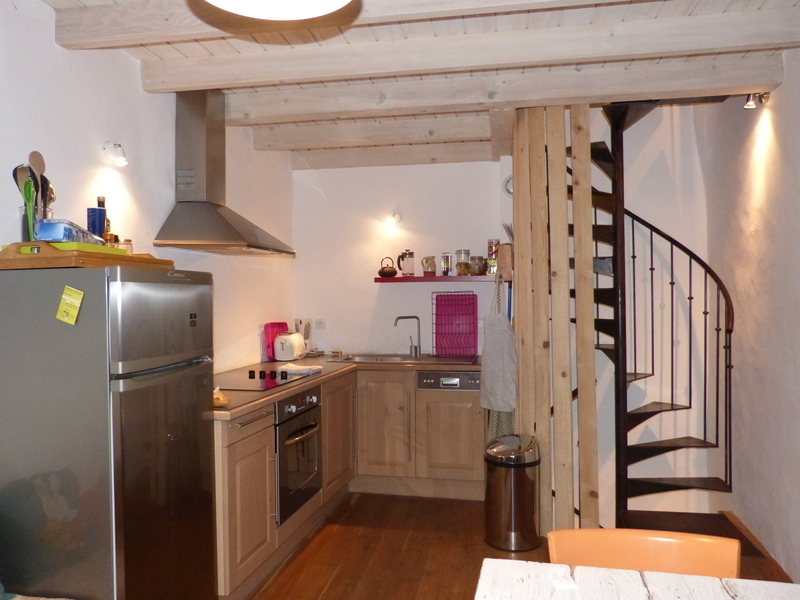 Here are some photographs of what I found in this very old, very beautiful village. I followed this road to the edge of the town and when I followed the bend in the road I found this amazing stone gate. 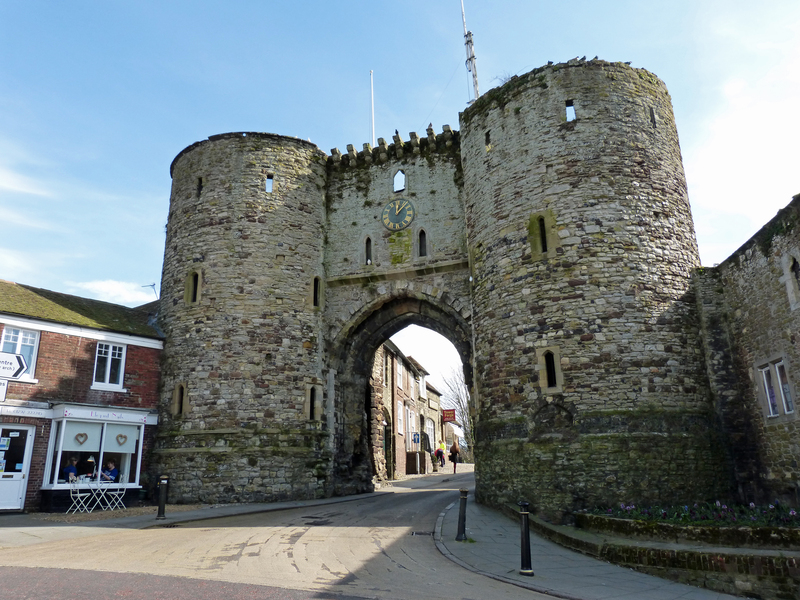 The plaque on the gate calls it the “Strand Gate” and says it was built around the year 1300. The sign says it was once one-third taller and was painted white. 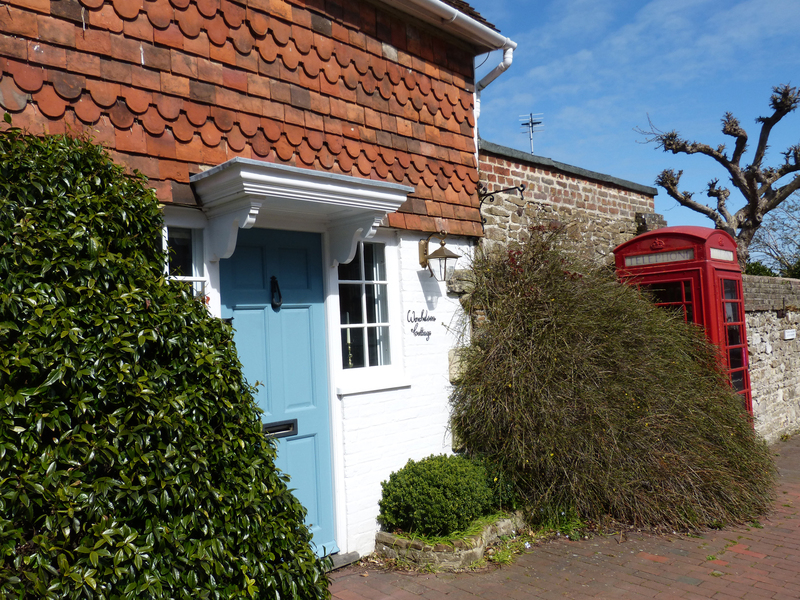 I found lovely “Woodlawn Cottage” not far from the church. Those shingles above the door are made of clay. It’s lambing season in sheep country. 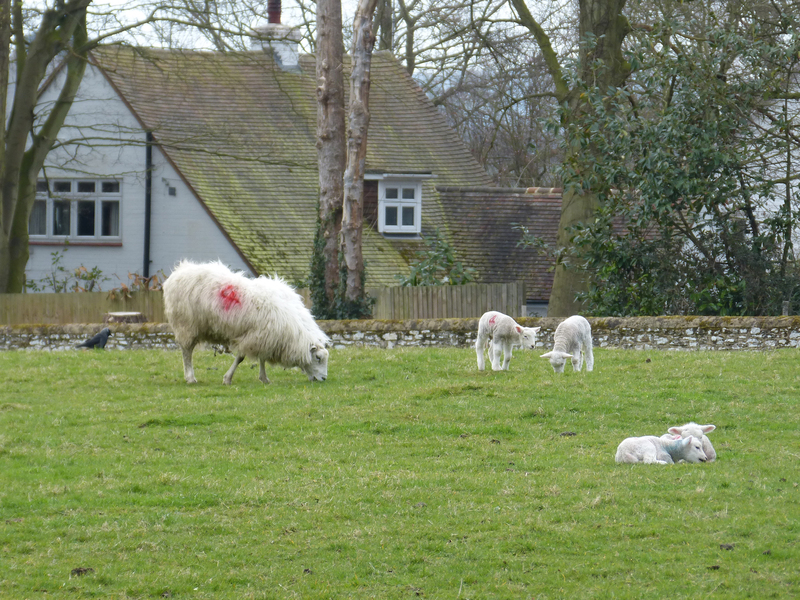 The red mark on the ewe identifies her owner. 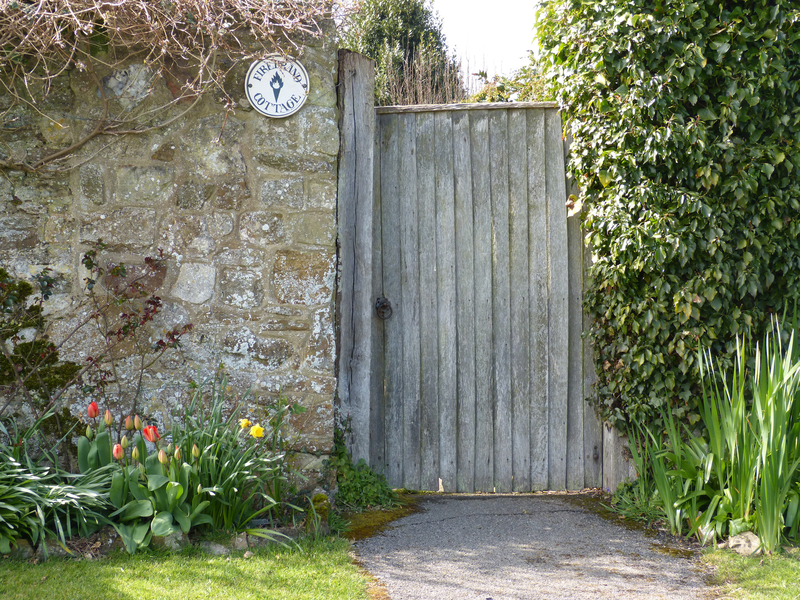 The charming garden gate beside someone’s beautiful home called Firebrand Cottage. And a final shot of the church. No one seems to know a date for the construction of this church or who caused it to be built. It is thought that it was much bigger originally and that what exists today is only the “chancel” (the choir behind the central altar) and remnants of the transepts. 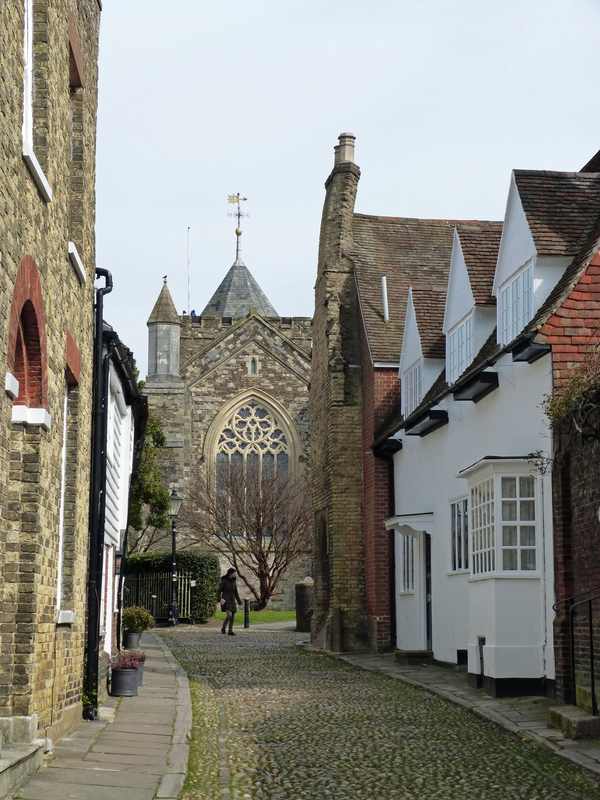 The missing parts were dismantled centuries ago to build the harbor at Rye and for other purposes. That was often done in England, particularly after the dissolution of the monasteries. It is thought that this church was never a monastery, but was always a parish church for what was once a very rich and much bigger town. 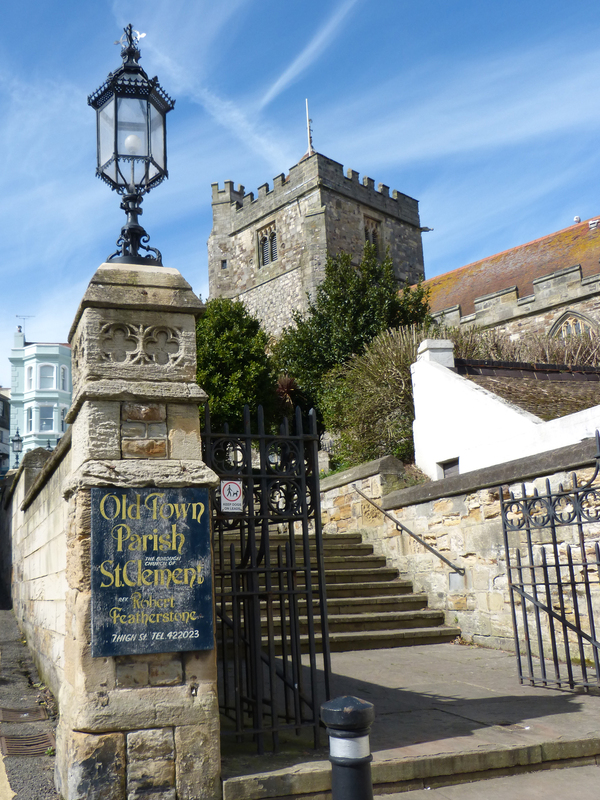 Please read a detailed history of the church here for much more information. 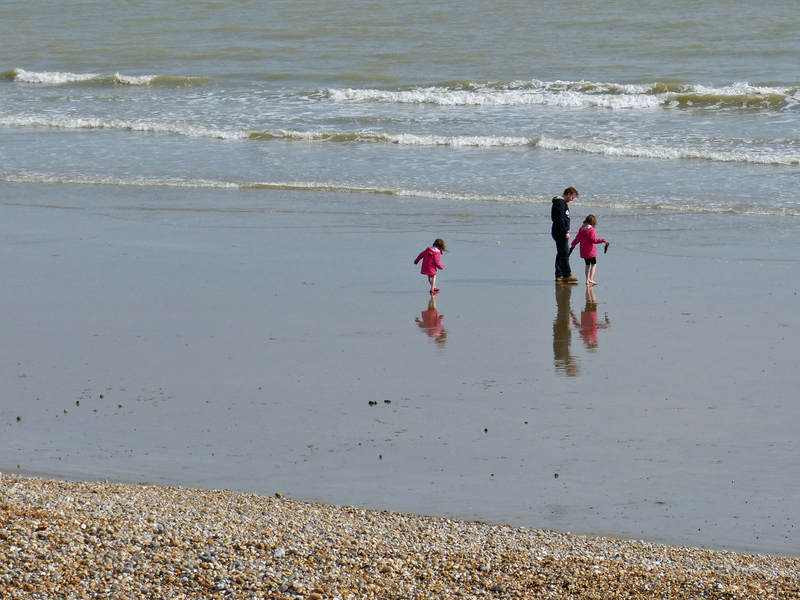 Yesterday I took a long walk to the western end of the Hastings beach. The weather was fine and there were many people out enjoying the first warm weekend of the season. The avenue that runs along the beach is lined on the other side with old hotels, one or two casinos, numerous restaurants. There’s a shopping mall and a large and beautiful old church in the center, just off this main street. But mostly it was the beach that caught my interest. 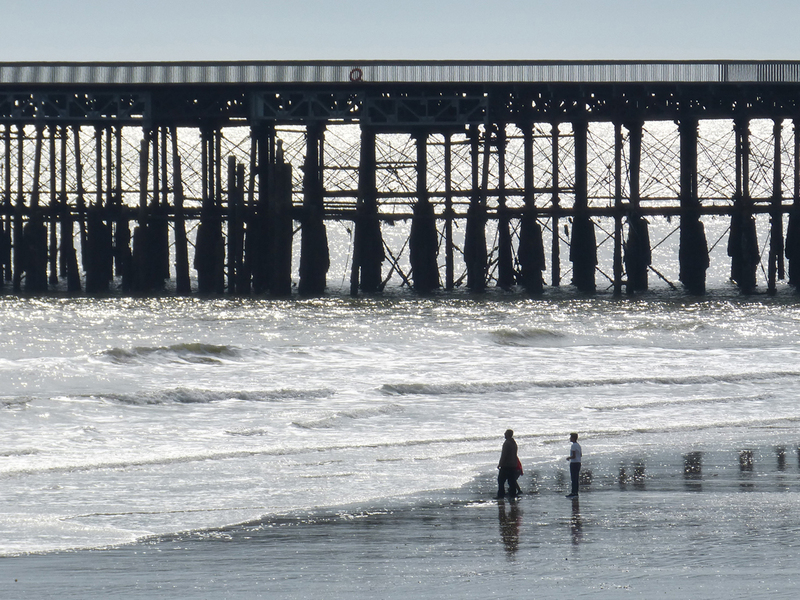 The sun was low enough to turn the sea silver on both sides of the long pier. There is sand on this beach when the tide is out! 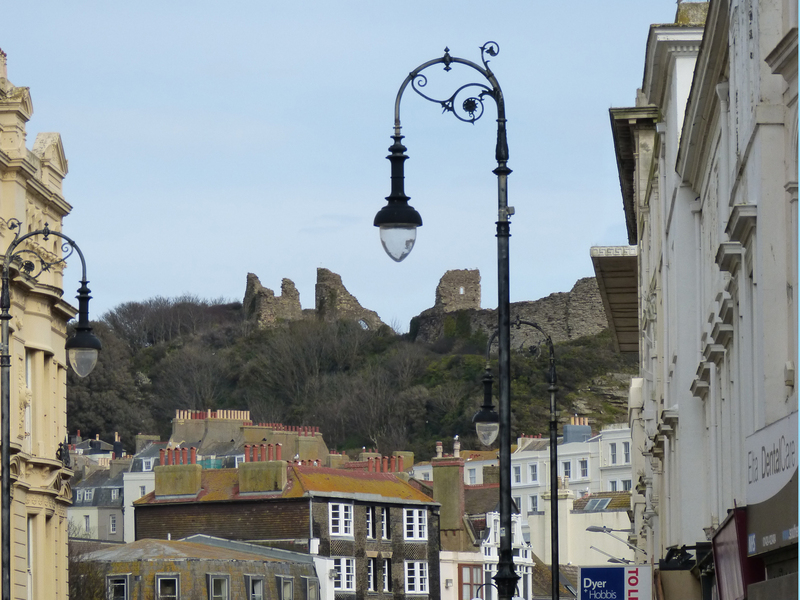 If you look under the teardrop lamp you’ll see, as I did for the first time yesterday, high on the hill above the town the remains of the castle that William the Conqueror ordered built almost immediately after winning the battle against the English. Tomorrow I’m off to Cambridge. Join me for a walk through this small and ancient town (population under 5000, a town since 1189 AD but occupied even earlier). Several of the buildings have painted on them “Rebuilt in 1420” but I’ve found no occurrence at that time to explain those notices. 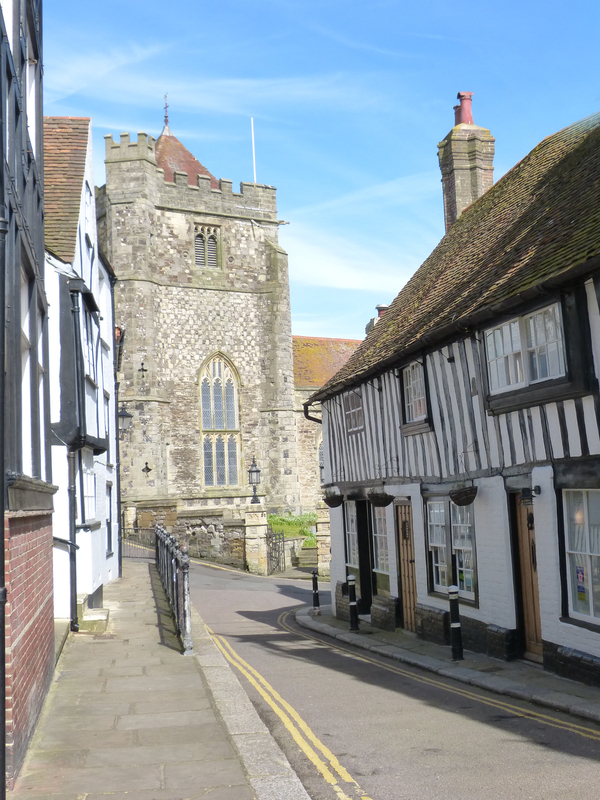 Once a prosperous trading port, Rye’s fortunes changed when the river silted up. Today its economy is largely based on tourism — and I think the pictures that follow will tell you why. 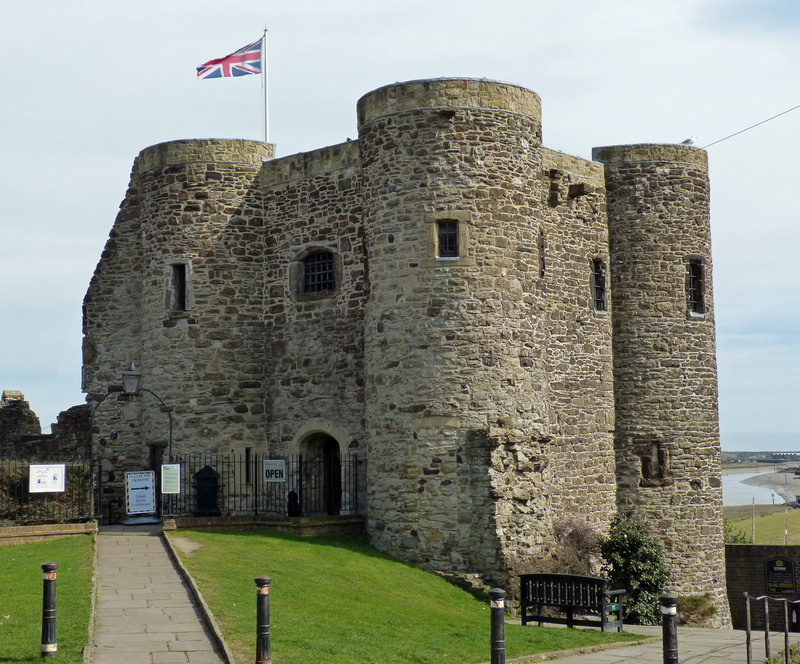 This tower was built in the year 1249 to guard the entrance to the town from the sea. The three or four commercial streets in the town center offer shopping, hospitality and dining. 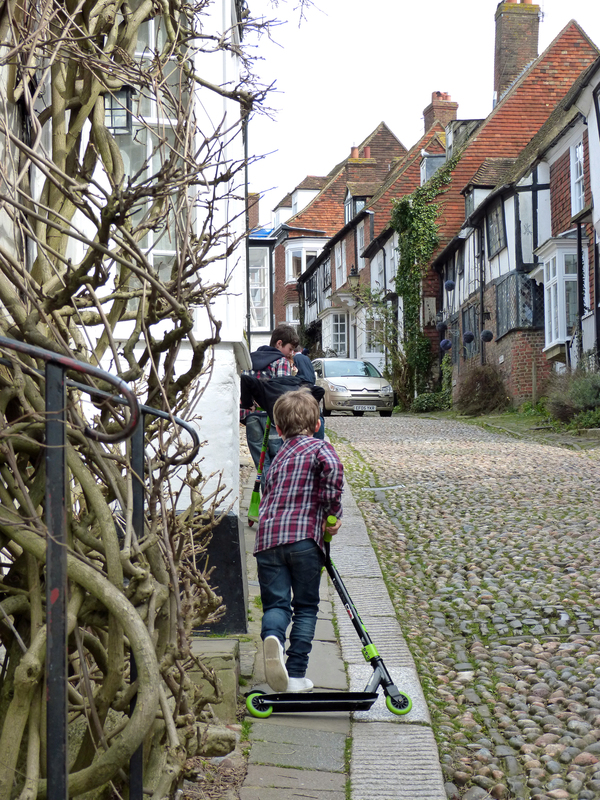 This steep, cobbled street is the site of the Mermaid Inn, one of the buildings dating to 1420. The cellars date from the mid-1100s. The view at the top of this post is taken from the top of Mermaid Street, with the Mermaid Inn on the right. Here’s a close-up of the one very old house across from the inn. 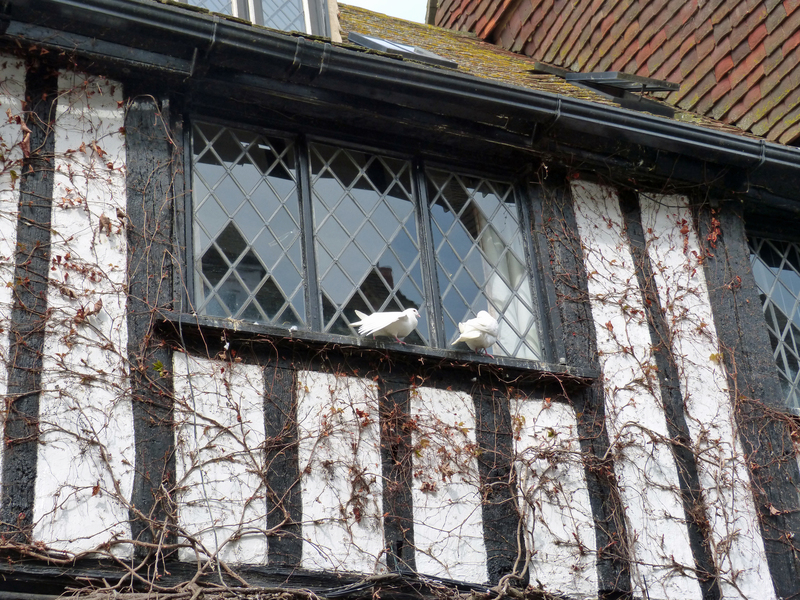 See the white birds in the window of the Mermaid Inn? They are really pigeons but it’s said that they were brought here to be released after weddings, when it’s claimed that they are white love birds. At the top of the street and around the corner a glimpse of St. Mary’s church appears. The church is high on the hill. 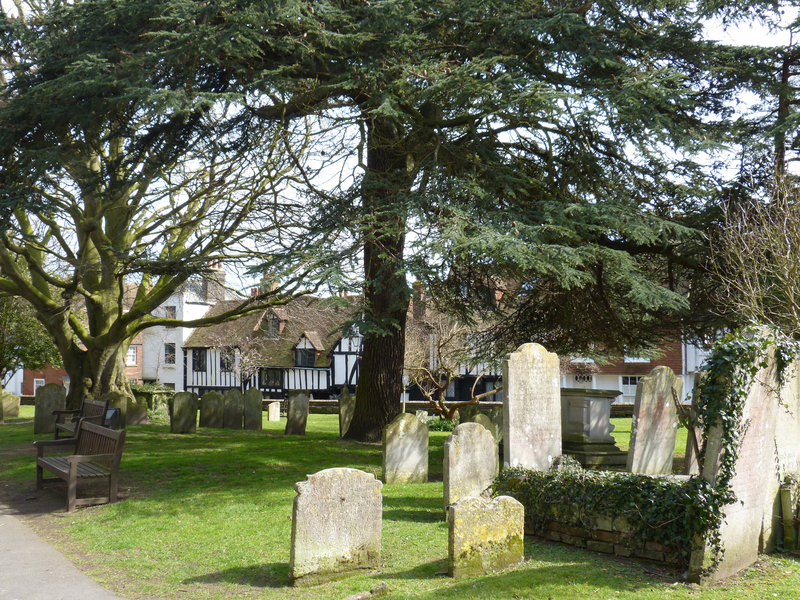 An old burial ground surrounds it. 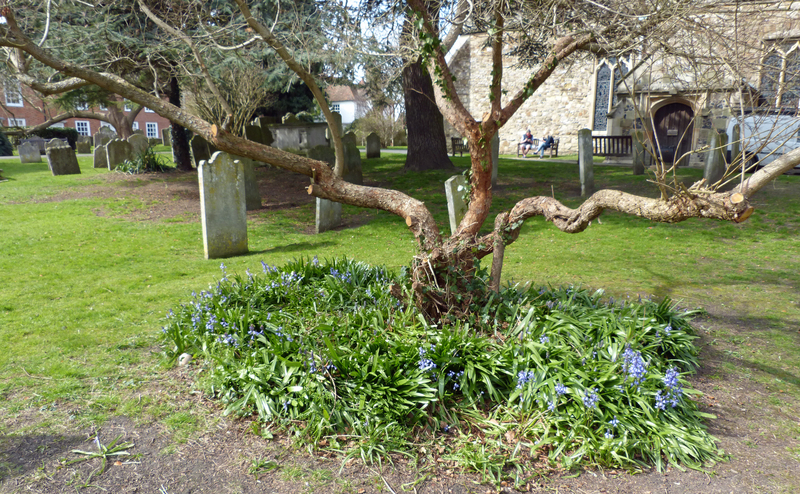 This curvaceous old tree is surrounded by English bluebells. This gate has been guarding the old town center since 1329. 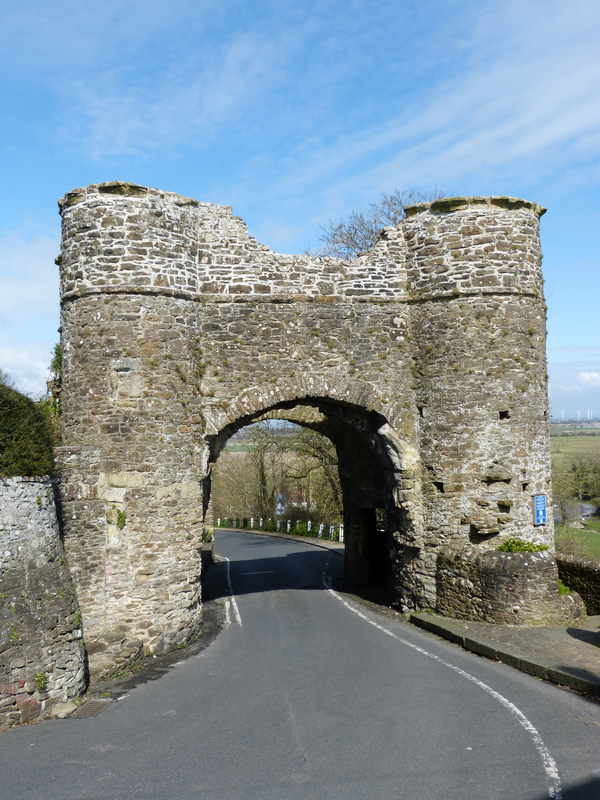 It is the only remaining gate of the four that were built as part of the wall that surrounded the town. Are you getting tired from climbing these hills? Here’s a spot to sit a while. Here’s a corner of the house and garden where Henry James lived. 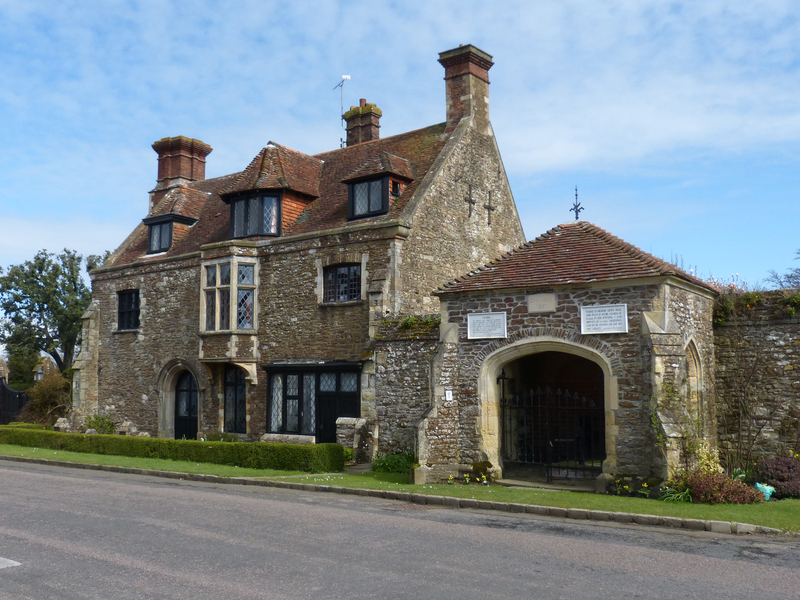 Called the Lamb House, it’s now owned by the National Trust and is open for tours. 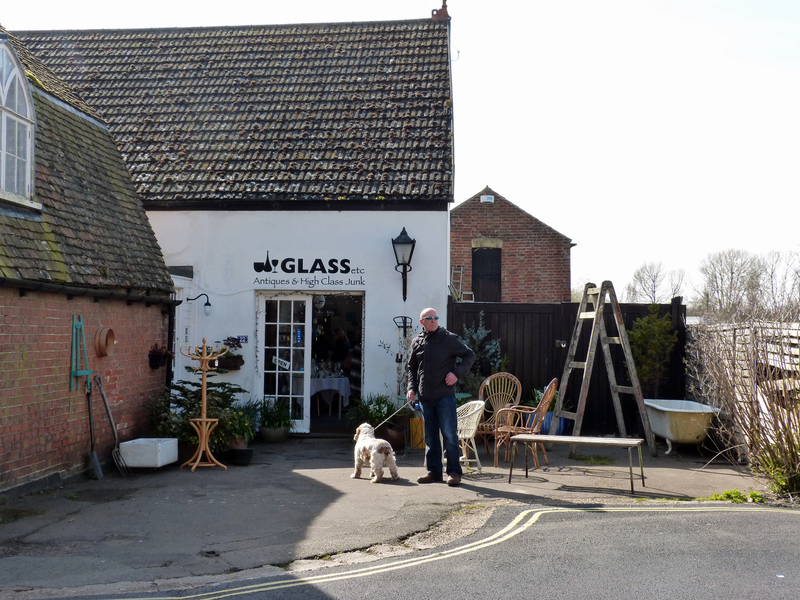 There are numerous antique dealers in Rye. Not everything sold by them is ancient or fancy! Ah! 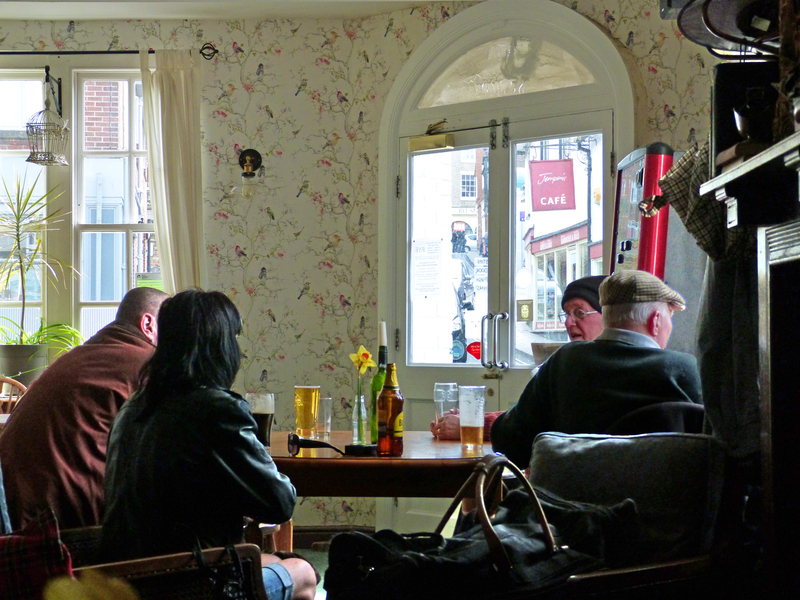 Here’s a good pub. Let’s end our walk here, near the train station, with a drink to restore us. I rely on Wikipedia to know everything! Here’s a link to that page for Rye. 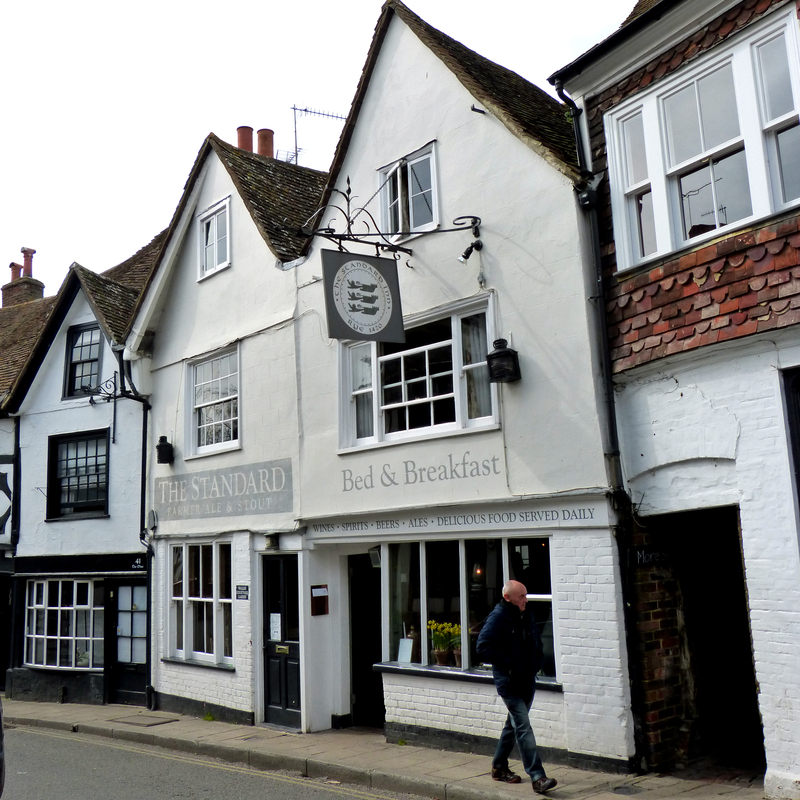 And here’s a link to the Mermaid Inn, said to be haunted! For those who have never seen the ITV program “Foyle’s War” I’ll quickly explain it. Foyle is chief of detectives in Hastings and the original setting was the years from 1940 to 1944 when the war in Europe was on. In each episode Foyle has a murder mystery to solve, and there’s a continuing storyline for each main character. It’s a true representation of what World War 2 was like for ordinary Brits: under bombardment and living with very strict rationing of food, gasoline, clothes and more. The program stars Michael Kitchen, a popular British actor, who portrays Foyle. It moves through time over several seasons until reaching the end of the war. 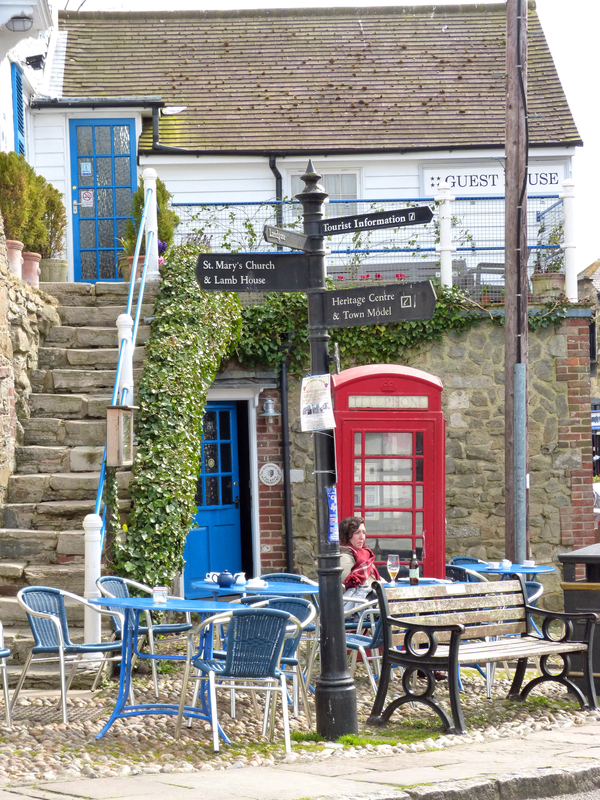 It was so popular, however, that’s it was revived with new programs set in post-war Hastings. If you haven’t discovered it yet, look for it on your PBS channel or find the programs on Amazon. 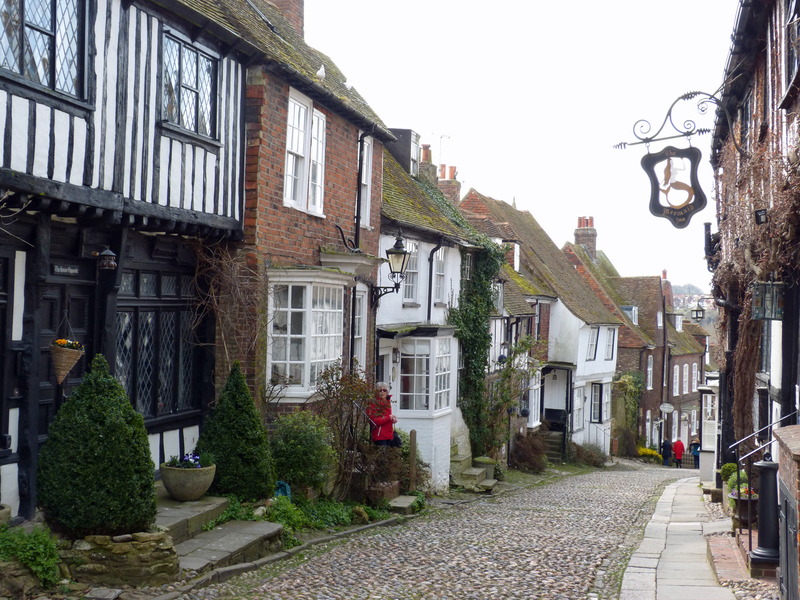 Having seen Old Town Hastings on many episodes of this program I’ve had Hastings high on my list of places to visit in England for a long time. I’ve been surprised by the town in some ways but not at all disappointed. 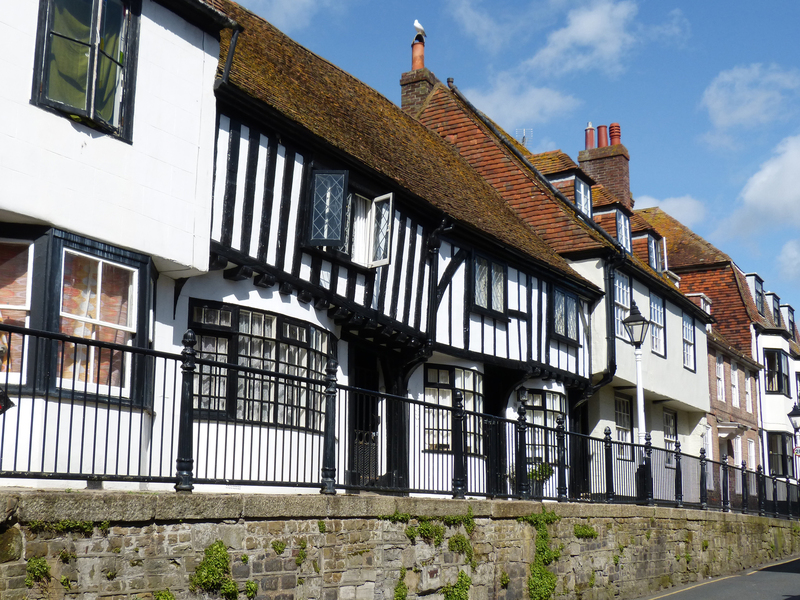 The bartender at the pub where I had lunch on Wednesday told me where to find “Foyle’s House.” Hastings’ Old Town section largely survived the bombing of the town from 1940 to 1945 intact. 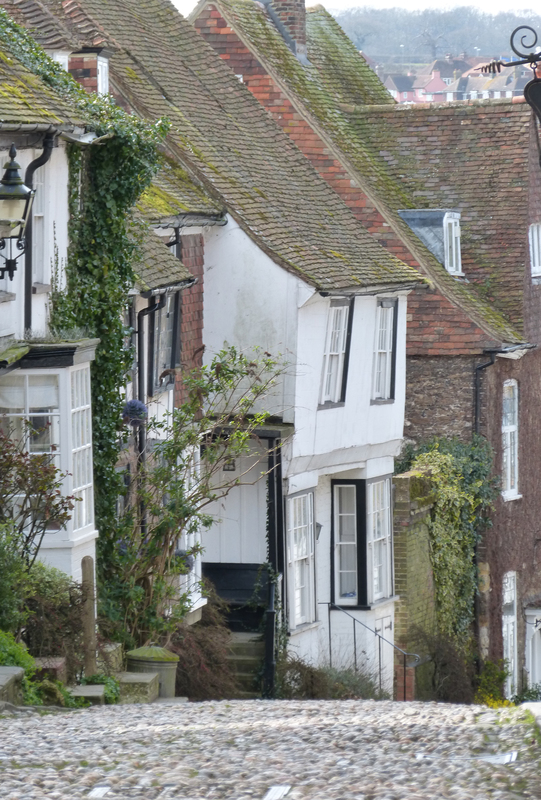 It is filled with ancient houses, many of them antique shops today. 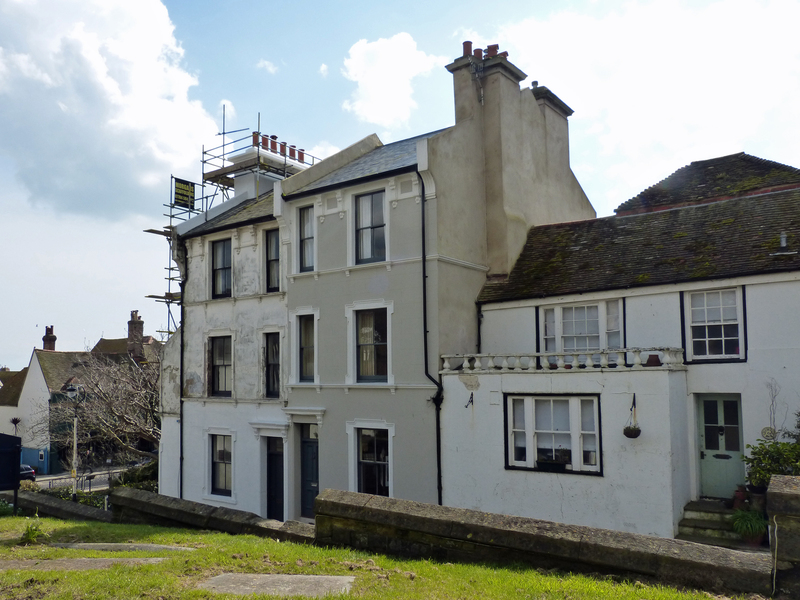 In researching the history of Hasting during the war I found a blog in which one woman, Victoria Seymour, details the filming of Foyle’s War and the war years in Hastings. 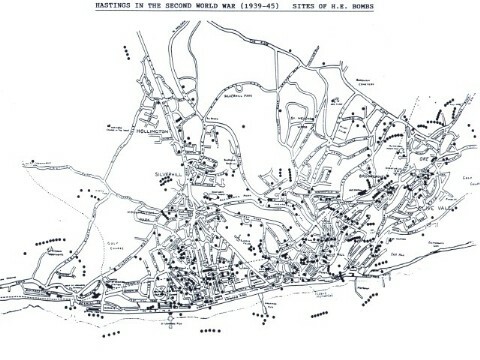 On her blog Mrs. Seymour has posted this graphic which shows the places that were bombed in Hastings during WW2. Each black dot represents a bombing. Here are a few pictures I’ve taken that may look familiar to fans of Foyle. 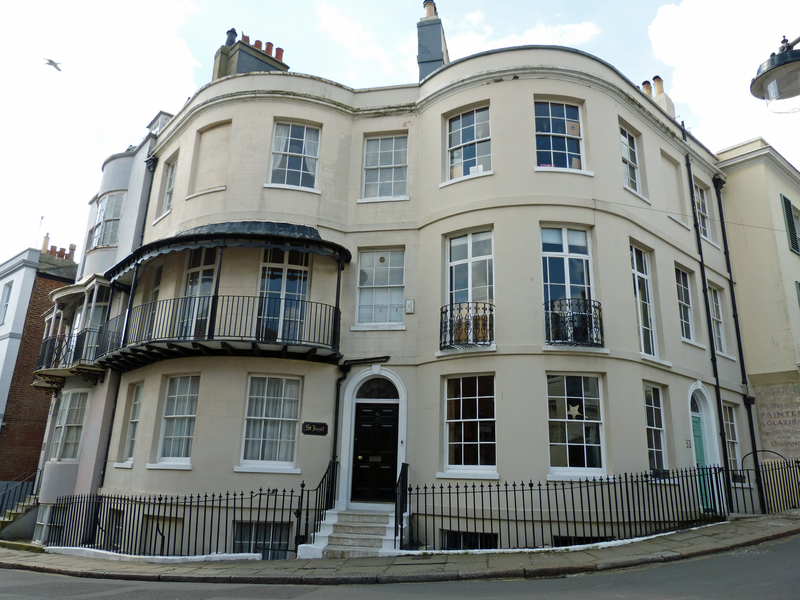 This is Foyle’s house, which is on Croft Street in the heart of the Old Town, near the old church. The door to the house which is seen in many episodes when “Sam” (Foyle’s young female driver) calls for him in a circa-1940 automobile. This is the parish church that survived bombs falling all around it for five years. 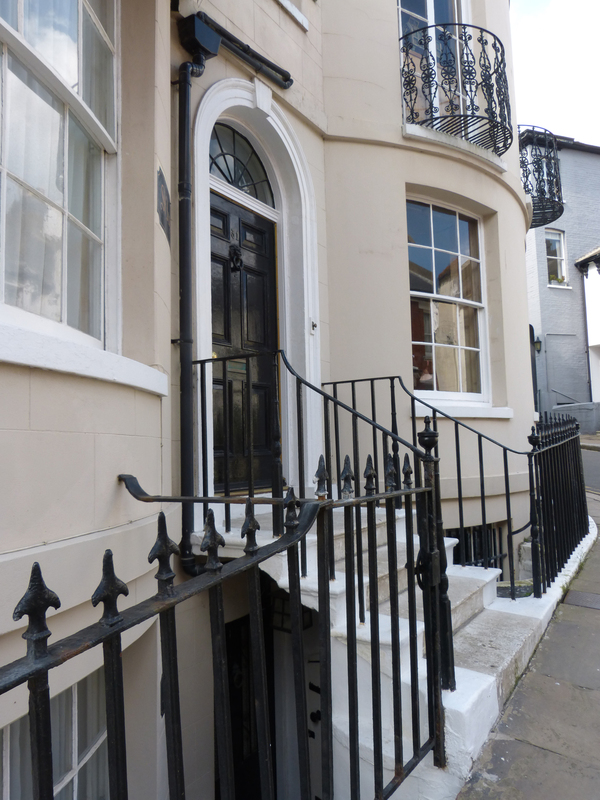 It’s at the other end of the block from Foyle’s house. 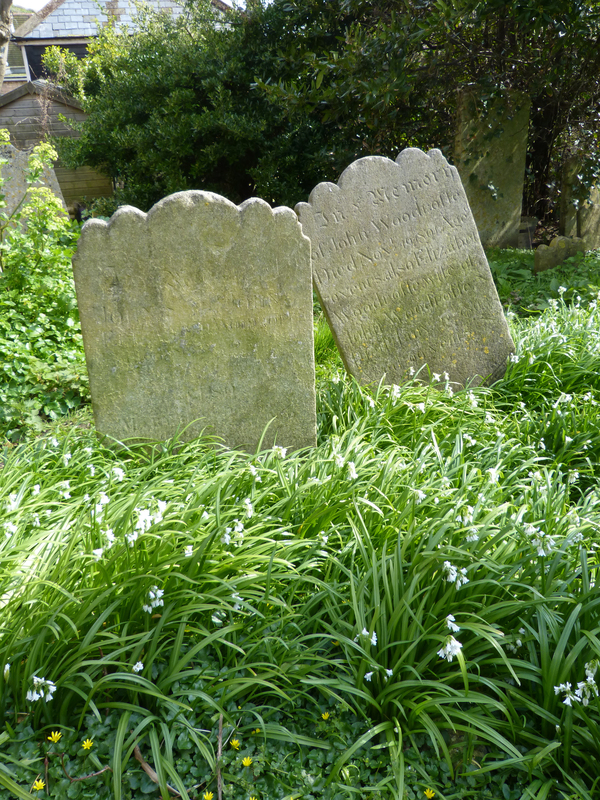 Today the church graveyard is filled with English blue bells in bloom. Croft Street is lined with medieval houses although “his house” is probably turn-of-the-20th century. 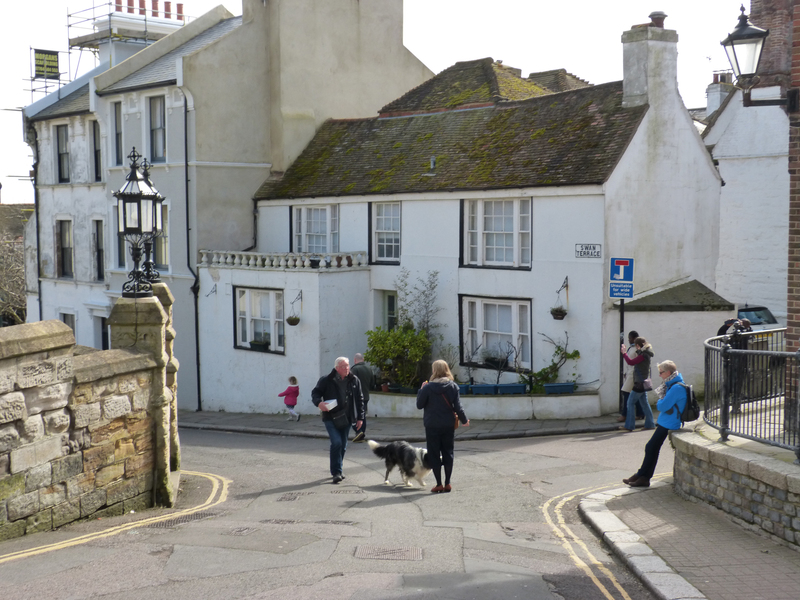 The streets with the oldest homes in Hastings have elevated sidewalks on one side of the street, presumably because the streets were leveled at some point to accommodate their hillside location. This street called Swan Terrace which runs up the side of the church shows how hit-or-miss the bomb damage was. This is Swan Terrace again. Notice the empty lot at the bottom of the street. 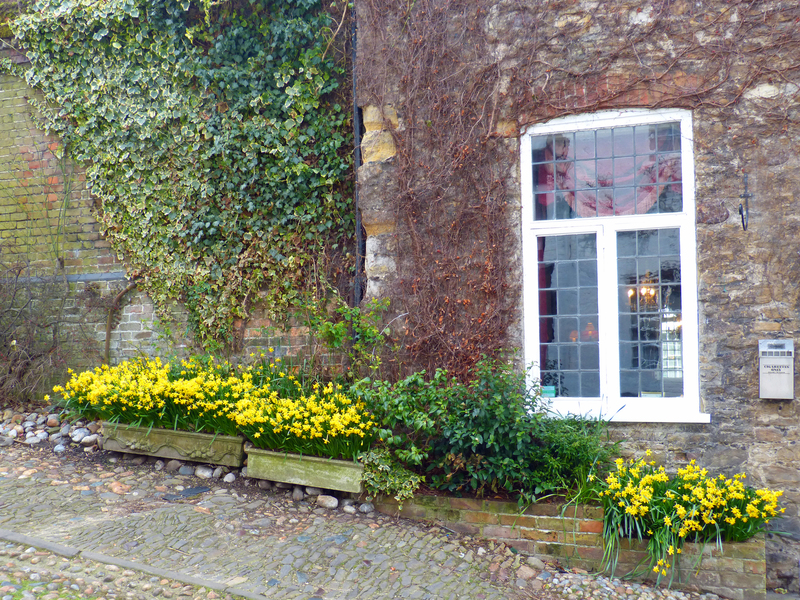 This was the scene of the Swan Inn, built in 1523. On Sunday, May 23, 1943, at lunch time, a bomb was dropped on the inn killing 16 people and injuring many more. 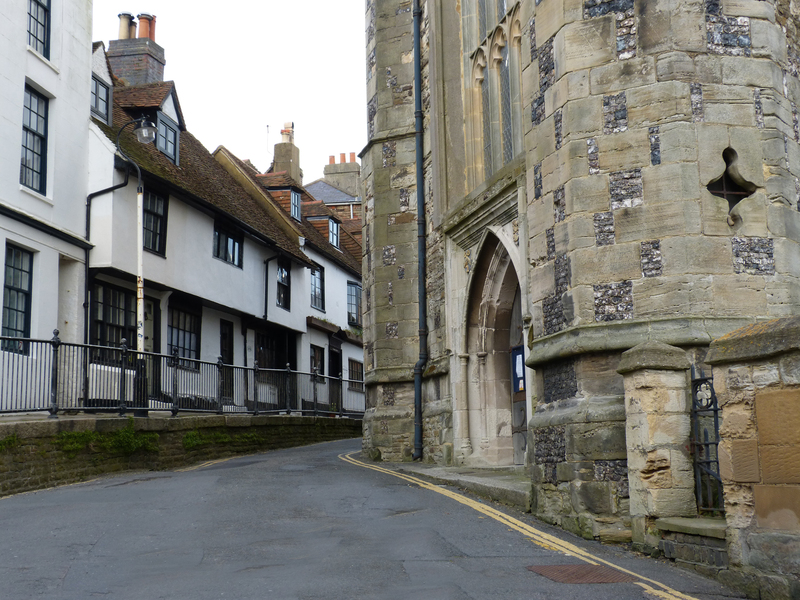 The inn was not rebuilt and the location, today a small park, serves as a memorial to all who lost their lives in Hastings during World War Two.